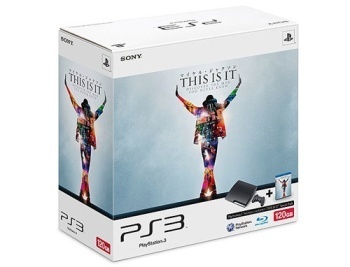 Sony is releasing a special Michael Jackson-branded PlayStation 3 bundle in Japan later this month to tie in with the DVD release of the This Is It concert documentary. Dyin' ain't much of a living, unless you happen to be the disgraced, debt-burdened former king of pop, in which case it's probably the best thing you could do for your career. You won't be around to reap the rewards, which is a bit of a downside, but your beneficiaries will no doubt be appreciative, as will the companies who can take advantage of the situation - tastefully and respectfully, of course - by slapping your name all over their stuff. Case in point: The This Is It PlayStation 3 bundle coming out in Japan. The package will contain a 120GB PlayStation 3, a Dual Shock 3 controller and a Blu-ray copy of This Is it, the documentary of Jackson's rehearsals for his planned farewell concert series in London, England. Jackson died in June 2009, however, less than a month before the shows were scheduled to start. There's really not much going for this bundle aside from the catchy packaging, which for the record is just a duplicate of the This Is It cover with some PS3 stuff slapped on it. It'll probably sell like hotcakes anyway, although it won't do much to dispel accusations that Sony is merely capitalizing on the singer's death in order to turn a profit. Then again, similar complaints dogged the company over the This Is It film and it earned more than a quarter billion dollars during its theatrical release. That kind of money takes a lot of the sting out of hurtful emails from angry fans. The This Is It PlayStation 3 bundle will be released in Japan on January 27 and will retail for roughly $363.